Seasonally, some 58 million years ago, in the Green River region of Wyoming, torrential rains would occur in the mountains. As the rain waters flowed down the mountain sides, wide shallow lakes were formed in the valley, but then evaporated during the dry seasons. This happened in a cycle of 20,000 years, during which millions of fish died. 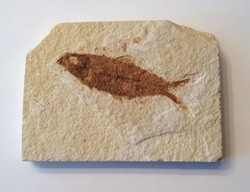 Fossils of the fish were preserved in the shale that formed in layers. A reddish sandstone, which contained no fish, was deposited on top of the shale by a large river, which helped protect the underlying shale. Sometime later volcanic eruptions uplifted the land in areas where there were faults in the earth, exposing fossil laden cliff faces. One of the most common fish fossils found in this formation is the extinct Knightia genus. It was a clupeid bony fish that lived during the Eocene epoch. It was a small schooling fish that belongs to the same taxonomic family as herring and sardines. Rows of dorsal and ventral scutes ran from the back of the head to the medial fins. They had heavy scales, and small conical teeth. The specimen owned is a single fish fossil measuring approximately 2 ½ inches that is in a rock matrix measuring approximately 3 ¾” x 2 ¾”.